Khan Resources Inc. (“Khan” or the “Company”) (CSE:KRI) announces that it has posted on its website (www.khanresources.com) the Award on the Merits rendered in favour of Khan by the international arbitration tribunal on March 2, 2015. The Company has also posted on its website the Decision on Jurisdiction also rendered in favour of Khan by the same Tribunal on July 25, 2012. The members of the Tribunal were unanimous in both of the decisions. The Award on the Merits asserts that the Government of Mongolia did not comport with Mongolian Law or the Rule of Law. 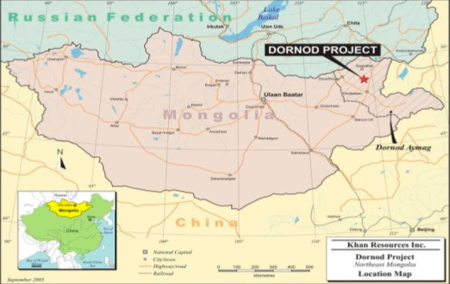 The Tribunal accepted Khan’s argument that the Government of Mongolia had no valid legal basis to invalidate Khan’s licenses and only did so because of its desire to operate the Dornod project in partnership with Russia (through its state owned enterprises Rosatom and Atomredmetzoloto). The Tribunal found that the evidence provided by Khan, and in particular, the timing of various inspections, reports and invalidation notices, indicate that the Government was in fact motivated by the prospect of developing the Dornod project at greater profit with a Russian partner. The strength, clarity and forcefulness of these decisions reinforce Khan’s determination to obtain value for its shareholders from the illegal expropriation of its licenses. This press release may contain forward-looking statements and forward-looking information, which are subject to certain risks, uncertainties and assumptions. Forward-looking statements and information are characterized by words such as “will”, “plan”, “expect”, “project”, “intend”, “believe”, “anticipate”, “forecast”, “schedule”, “estimate” and similar expressions, or statements that certain events or conditions “may” or “will” occur. Forward-looking statements and information are not historical facts and are based upon a number of estimates and assumptions and are inherently subject to significant business, social, economic, political, regulatory, competitive and other risks and uncertainties, contingencies and other factors, including the impact of international, Mongolian and Canadian laws, trade agreements, treaties and regulatory requirements on Khan’s business, operations and capital structure, regulatory uncertainty and obtaining governmental and regulatory approvals, legislative, political, social, regulatory and economic developments or changes in jurisdictions in which Khan carries on business, the nature and outcome of the international arbitration proceedings (the “International Arbitration”) against the Government of Mongolia or the collection of all or part of the award rendered by the tribunal for the International Arbitration proceedings against the Government of Mongolia or any future litigation, arbitration and other legal or regulatory proceedings, changes in market conditions, changes or disruptions in the securities markets and market fluctuations in prices for Khan securities, the existence of third parties interested in purchasing some or all of the common shares or Khan’s assets, the method of funding and availability of any potential alternative strategic transactions involving Khan or its assets, including those transactions that may produce strategic value to shareholders, fluctuations in currency exchange rates and interest rates, including fluctuations in the value of the United States dollar and the Canadian dollar relative to the Mongolian tögrög, changes in national and local government legislation, taxation, controls, regulations and political or economic developments in Canada, Bermuda, the Netherlands, Mongolia or the British Virgin Islands and any other jurisdiction in which the Company carries on business, political instability, insurrection, war or terrorism, hostilities and the occurrence of natural disasters; requirements for additional capital; environmental risks, the need to comply with national and international laws, regulations, treaties or other similar requirements. In addition, a number of other factors could cause actual results to differ materially from the results discussed in such statements and information, and there is no assurance that actual results will be consistent with them. Many of these risks, uncertainties and contingencies can affect the Company’s actual results, performance, events or achievements and could cause actual performance, actions, events or results to differ materially from those expressed or implied in any forward-looking information. All of the forward-looking information in this press release is qualified by these cautionary statements. There can be no assurance that forward-looking information will prove to be accurate, as actual results and future events could differ materially from those anticipated in such statements containing forward-looking information. Accordingly, readers should not place undue reliance on forward-looking information. For further details, reference is made to the risk factors discussed or referred to in Khan’s annual and interim management’s discussion and analyses and Annual Information Form on file with the Canadian securities regulatory authorities and available on SEDAR at www.sedar.com. Such forward-looking statements and information are made or given as at the date of this news release, and Khan assumes no obligation to update or revise them, either publicly or otherwise, to reflect new events, information or circumstances, except as may be required under applicable securities law.